Bad breath, also called halitosis, can sometimes be caused by small stones that form on the tonsils. These tonsil stones (tonsilloliths) are made by clusters of calcified material in the crevices of the tonsils, also known as the tonsillar crypts. These stone-like clusters are composed of primarily calcium, but may also contain other materials like magnesium and phosphorus. Although tonsil stones are rarely harmful, they can feel like a small lump in the tonsils and cause irritation. Because they are often difficult to remove, they can contribute to bad breath for an extended period of time. While many people experience small tonsilloliths, it is generally rare to have a large, fully solidified tonsil stone. Your tonsils are small lymphatic glands on either side of the back of your throat. Most medical experts believe that the tonsils function in the trapping of microorganisms like bacteria and viruses that pass through the throat. Often, however, the tonsils’ trapping function becomes more of a hindrance than a help, since the trapped debris in the tonsillar crypts serves as a prime breeding ground for bacteria. The tonsil stones themselves are caused by the buildup of sulfur-producing bacteria and debris from food particles and postnasal mucus. This buildup forms small lumps that become lodged in the tonsils, causing infection and pain. 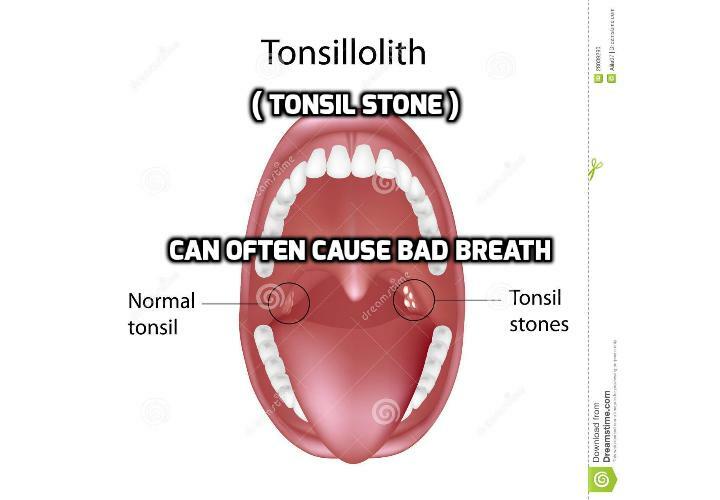 Bad breath accompanies a tonsil infection and is generally considered the prime indicator of tonsil stones. This is because smelly volatile-sulfur compounds often accompany tonsil stones. Clinical research indicates that 75% of people with abnormally high volatile sulfur concentration in their breath also suffered from tonsil stones. To prevent tonsil stone formation and bad breath, make sure to maintain a healthy daily oral-hygiene routine of flossing and brushing your teeth and gums. Using an antibacterial mouthwash each day can also target bacteria buildup and neutralize chemicals that cause bad breath. If you suffer from chronic tonsil infection or large, recurrent tonsil stones, speak to your doctor about taking antibiotics or having your tonsils removed. Next PostNext Which doctors may treat bad breath?